First, selfishness. Those who are selfish seek their own interests and pleasure above all else. The central question for the selfish person is “What’s in it for me?” Brethren, I am sure you can see that this attitude is clearly contrary to the spirit required to build God’s kingdom. When we seek self-service over selfless-service, our priorities become centered on our own recognition and pleasure. Past generations had their struggle with variations of egotism and narcissism, but I think today we are giving them serious competition. Is it any coincidence that the Oxford Dictionary recently proclaimed “selfie” as the word of the year Naturally, we all have a desire for recognition, and there is nothing wrong with relaxing and enjoying ourselves. But when seeking the “gain and praise of the world” is a central part of our motivation, we will miss the redemptive and joyful experiences that come when we give generously of ourselves to the work of the Lord. What is the remedy? The answer, as always, lies in the words of Christ: “Whosoever will come after me, let him deny himself, and take up his cross, and follow me. 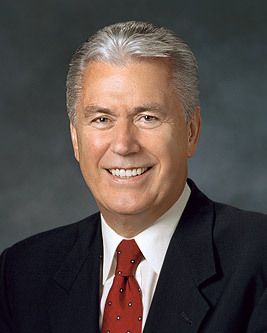 “For whosoever will save his life shall lose it; but whosoever shall lose his life for my sake and the gospel’s, the same shall save it.” Those who wholeheartedly turn their lives over to our Savior and serve God and fellowman discover a richness and fulness to life that the selfish or egotistic will never experience. The unselfish give of themselves. These may be small gifts of charity that have a grand impact for good: a smile, a handshake, a hug, time spent in listening, a soft word of encouragement, or a gesture of caring. All these acts of kindness can change hearts and lives. When we take advantage of the unlimited opportunities to love and serve our fellowmen, including our spouse and family, our capacity to love God and to serve others will greatly increase. Those who serve others will not sleep through the Restoration.